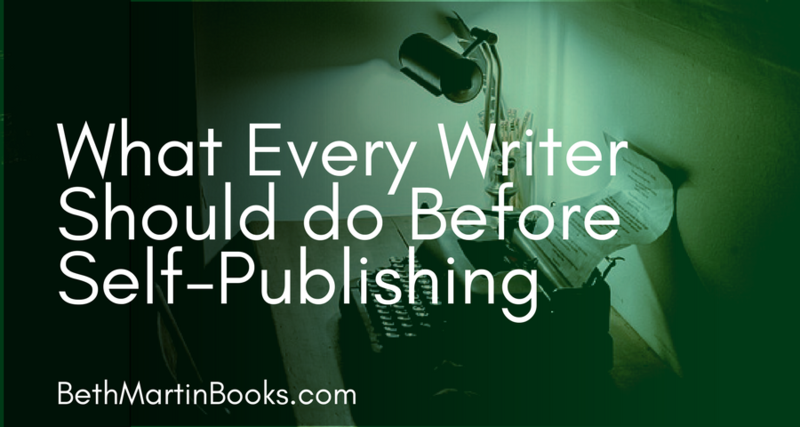 When it comes to publishing, writing the book is the easy part. I'm not trivializing the work involved in writing a book—it's hard—but once you're ready to unleash your manuscript into the world, there are a number of things you can do to ensure success. I recently came across a story of an aspiring author who jumped too quickly into self-publishing her novel and marveled at the train wreck which resulted. As I'm gearing up for the release of my second novel, it's clear to me that this woman skipped a lot of steps to ensure a successful launch into her writing career. So I thought I'd share a list of things aspiring authors should do before hitting publish on their own. These tips are focused more on preparing you the person to be a successful author and less about getting your manuscript ready for publication. Now, this isn't an exhaustive list, and some writers may succeed even though they skip a few. But if you're still unpublished and unproven, read on! Sounds so simple, right? I can't tell you how many times I've read about writers being so happy about just finished a draft that they immediately turned around and published it even though they didn't think the book was all that good. And you're asking people to pay money for it?! This is surprisingly hard, especially for your first manuscript. It's startling how much of yourself goes into writing a piece of fiction, so when friends and family ask to read it, it feels like ripping open your chest and exposing your heart. However, feedback is absolutely critical in crafting the best story possible. As the writer, you're just too close to your work to see all of the flaws, and that's where having other people read your book comes in. Part of the reason letting other people read your work is so hard is because they very likely might say something negative. Criticism is a good thing—it tells you where you can make your novel stronger. Just because someone says something isn't working in your book doesn't mean you personally are a failure and your manuscript deserves to go straight in the trash. On the other hand, don't disregard every word of critique you get. Use readers feedback to change your novel for the better. You're about to enter the strange world of publishing. Educate yourself on what exactly you're getting into. Publishing has changed a lot over time, and even more so in recent years with the prevalence of eReaders and affordability of digital printing. But even now, it takes a team to turn a rough manuscript into a sellable book and this is a process which traditional publishers have perfected over time. There are a lot of misconceptions about publishing floating around, so it's important to inform yourself about the process of how a book gets to the shelves at your local bookstore and how publishers acquire the books they sell. When deciding to self-publish, you alone will be doing all the work of a publishing house (or hiring others to help). Get your feet wet in the traditional publishing scene. Write a query letter for your manuscript and send it to a few literary agents and/or publishers. There are multiple reasons for doing this, even if you're confident that self-publishing is the best option for your writing career. First, it's a chance to try and sell yourself and your manuscript. Writing a query letter is difficult, but guess what, so is writing the blurb for your novel. Both serve a similar purpose: convincing someone to take a shot on your book. The second reason is that literary agents and publishers have a good idea on what books sell. If you can get them interested in your novel, then you know your book has a good chance of becoming successful. When you decide to self-publish, you are essentially starting up a business. You'll be in charge of all the details involved in publishing from cover design to marketing. There won't be a publishing house behind you taking care of details or keeping track of your schedule. It's all on you. Since all the decisions rest on your shoulders, you'll want to make the best decisions for yourself, your career, and your novel. Will you only publish an ebook, paperback, or both? How often will you update your author website? Where should you advertise your books? Once you've learned all the basics of publishing, it's time to go out there and meet some likeminded people. There are a bunch of writing and self-publishing forums on the internet. Check a bunch of them out and find a community to join. You want to find a group of people who have done this before where you all can share experiences and ask questions. Sometimes even the simplest task can trip you up (like first line indents for ebooks—this one took me an embarrassing amount of time to get right) or you'll want to ask for opinions from people with experience. I've actually made quite a few writing friends through social media. Social media also provides a platform for you to interact with your (future) readers and fans. It's also great for spreading the news about your upcoming book. Marketing your books can get expensive fast, but social media can get your face out there with only a small time investment.